I’m not sure how it happened so fast, but the Grey’s Anatomy winter finale just went down — and, to be honest, it was kind of a game-changer. Apparently Shonda Rhimes was feeling real salty this week, because she left fans with not one but two big ol’ cliffhangers. First, there’s the whole Amelia and Owen debacle. Newlyweds though they may be, these two have basically been on life support as a couple since they said “I do.” Of course, we all know that Amelia hasn’t come to terms with her past enough to share it with Owen, and we all know that Owen is suffering from PTSD-like delusions again… but they don’t have the benefit of audience omniscience. This week, Amelia didn’t even come to work. It’s that bad between the two of them, apparently. If there is a silver lining to the situation, though, it’s that Owen and Riggs wind up having a heart-to-heart. Owen admits he cheated on Cristina, and he also admits how much he’s struggling with the fact that he feels like he’s back in the same baby-less situation he was with her. Regardless of what happens between Amelia and Owen, I’m hoping these guys will bro it up. In my mind, they’re the new-age Derek and Sloan. But I digress. At the end of the night, Riggs asks Owen to go grab a drink, and he in turn asks for a rain check — he wants to go home and see his wife, he says. The only problem with that is that Amelia isn’t at their home. When he arrives, he finds a letter on the counter that would seem to suggest she has left him. Heck, that letter makes it seem like she’s leaving Seattle altogether. That’s cliffhanger No. 1. The second cliffhanger, it should come as no big surprise, comes by way of everyone’s favorite beleaguered pediatric surgeon, Alex Karev. His potential jail time/exit from the show has been teased for weeks now, so we knew it was a possibility coming into this week’s winter finale. However, there did seem to be some progress that hadn’t been made before, offering up a little hope something might change. For starters, Jo finally reveals to Alex that she is married. That’s the reason she can’t marry him — because her name isn’t even Jo Wilson. These two actually had a few tearjerking scenes tonight, so thanks for that, Shon-da. Jo also tells Alex that if she disappears after the case, he shouldn’t take it personally. She would never want that, but she can’t let her husband find her. At that point, you start to see the wheels turning in Alex’s head. Naturally, he tries to talk to Meredith about it, but she’s having none of it. She’s his ride-or-die, and she feels like Jo could have intervened long ago and put an end to Alex’s persecution. But Alex goes to Bailey and tells her his plan. Moments later, he recounts it to Mer: he’s taking the plea deal. Then Jo won’t have to worry or be found out or leave. He is essentially sacrificing himself for her. He tries to tell Mer she will be OK, but she stubbornly insists this is about him. His life will be ruined, she says. His career. Everything he has worked so hard to achieve and become. Still, he leaves and heads to the courthouse to speak to the district attorney. As he sits down to wait, he realizes he has a voice message from Mer. In it, she begs him not to give up, promising she will always go down swinging for him. “There were five of us, and now there are two. There can’t just be me,” she pleads. Oh dear God, the feels. As someone returns to tell Alex the D.A. will see him now, he hangs up the phone — and the screen fades to black. Of course it does. Because now, we’ll have to wait until Jan. 19 to find out Alex’s fate, and it basically all boils down to whether or not he chooses to fight for himself and for Mer or to martyr himself (although, admittedly, he did do what he’s being charged with) for Jo. What will it be? Truth be told, I would not be heartbroken if he fights it and winds up sticking around. If that means Jo’s gotta go, well… bye girl, bye. 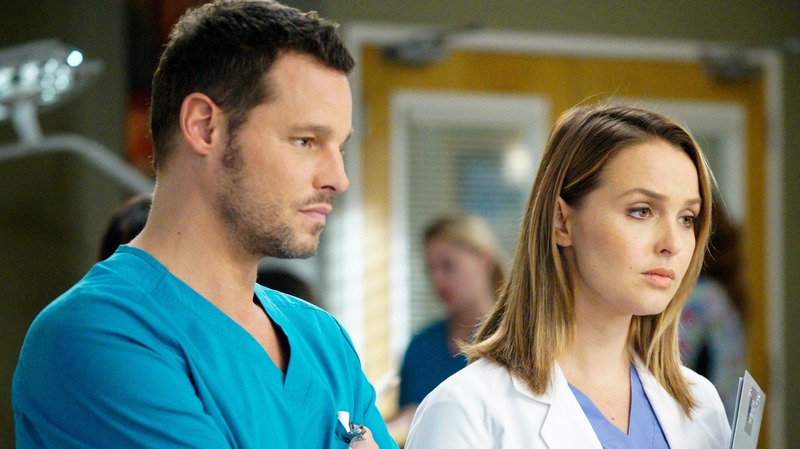 I heart Camilla Luddington and I was really rooting for Jo and Alex to work, but we super-fans are gonna need Alex to not bail on Mer. The woman has been through too much. She can’t lose her “person,” too — don’t make us play the McDreamy card. What do you think? Are Alex and Amelia both leaving?